My goodness! What a shocking outcome! The popular frontrunner to win, Mondo Guerra (@LoveMondoTrasho), was robbed according to the Twitterattis and blogs. Ms. Gretchen Jones (@Gretchen_Jones) took the grand prize of being this season’s winner. The judges sided with Ready To Wear over what Nina said was teenage fashion. You can get a refresher of what the lines looked like here Project Runway on LIfetimeTV. If your interested in Gretchen’s jewelry designer, check out my Fashion’s Fabulous Night Out – From NYC to LA Fashion's Fabulous Night Out - From NYC to LA post where I met him and all of this season’s contestants. And clearly, the decision was NOT an easy one for the judges. In an extensive, not very edited, look at the judges “chat”, we saw the judges yelling over each other in a way we have never seen on Project Runway before. Now, on to the SHOES! Ms. Jones did a pretty great job with her shoe choices on her runway. There was only a couple outfits that I would have gone in a slightly different direction, one being her finale dress. 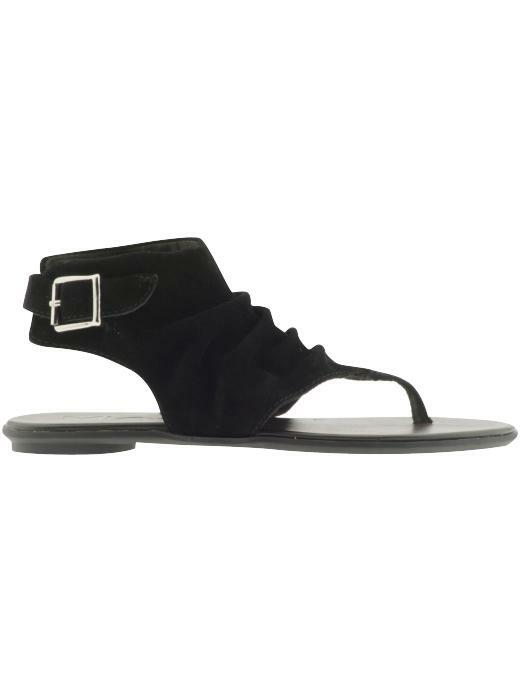 I think that the open toe lace up black suede ankle flat was definitely echoing the vibe of the outfit. However, because of the floor length hem of the dress with the sleeve, there was a lot of covering up happening. You needed to show a little more skin, or as Michael Kors called it, “relief”. The open toe and the open heel was a good call but still a little too much. That’s why I though that the Mia ‘Hayat’ was the better balance between the vibe of the outfit and the “relief”. ;) And it’s just super cute! 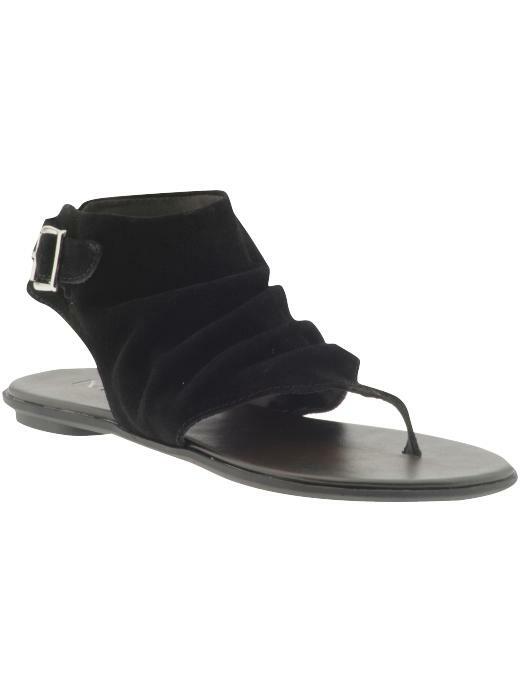 This black suede thong sandal has an ankle cuff with a ruching detail. 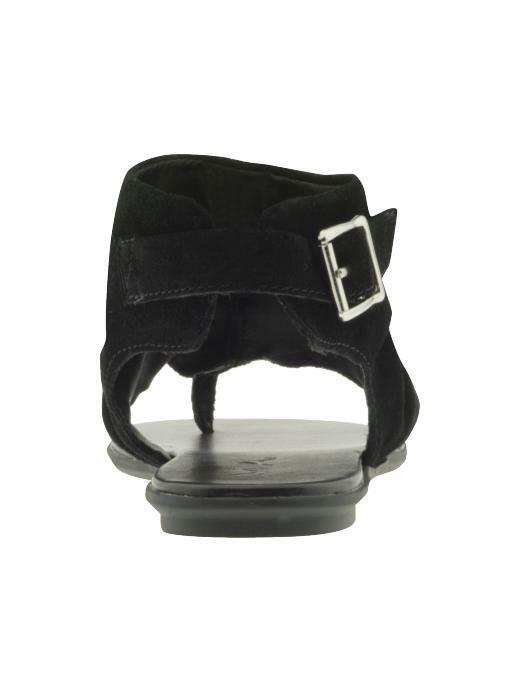 It also has an adjustable buckle closure on the outer backside of the ankle for that perfect fit. These are also a great pick for your shorter shorts and micro-mini hemlines that show off your gams. And the lesson of the day is versatility. Having the option to wear something several different ways not only expands your wardrobe but also makes your shopping choice a wiser investment. Your wardrobe needs to be a multitasker just like you! ;) At only $29.99 on Piperlime, it’s a total steal too. Congratulations to Gretchen and all of this season’s designers! They made for a greatly dramatic season that kept us all coming back for more. This has been one of the most memorable seasons for me. A special thanks to you for indulging me in What Would Project Runway Shoe? Who did you want to win?? Great shoe choice! Sad to see another season over. @Terry - what did you think of the winner? ?